Ancestry Research – Our main activity is that of providing our clients with a list of their ancestors in the form of a Direct Line Family Tree. i.e. Father, Grandfather, Great-Grandfather etc. Family trees are always based on marriages. Therefore, the information which we provide to our clients would include the names of both spouses, their respective parents’ and the date and place of marriage. – for each generation. The first marriage registrations in Local Parishes were recorded round about the year 1545. Therefore it would be almost impossible to trace one’s ancestors beyond this date. 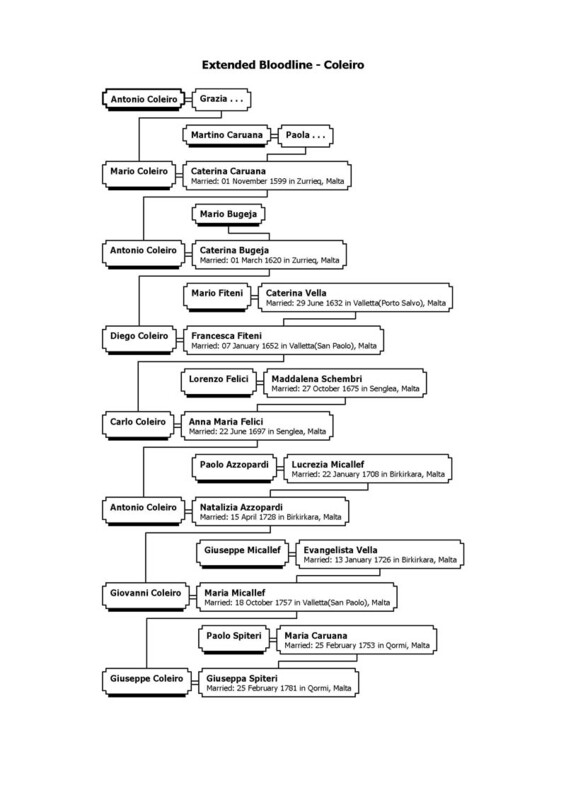 After compiling a Direct Line family chart, one may wish to expand further into another surname. This may be done at any time by simply adding on to a family chart. 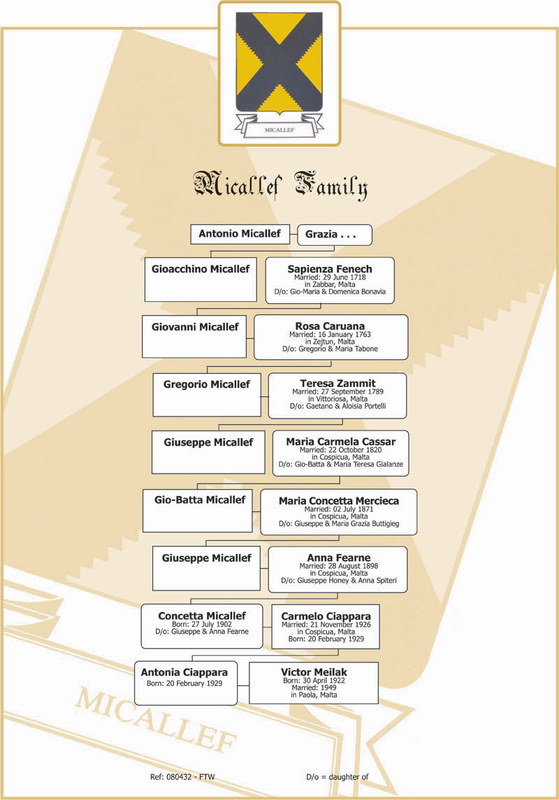 You may also order your family chart in a graphical wall chart or an Extended Bloodline which is similar to the direct line family tree with the addition of the bride’s parents’ marriage. Relationship Charts – Relationship Charts are slightly different to Direct line family charts since they may also include siblings. These charts are normally drawn up to illustrate relationships and are usually required for legal purposes, such as inheritance, division of assets, right of ownership etc. 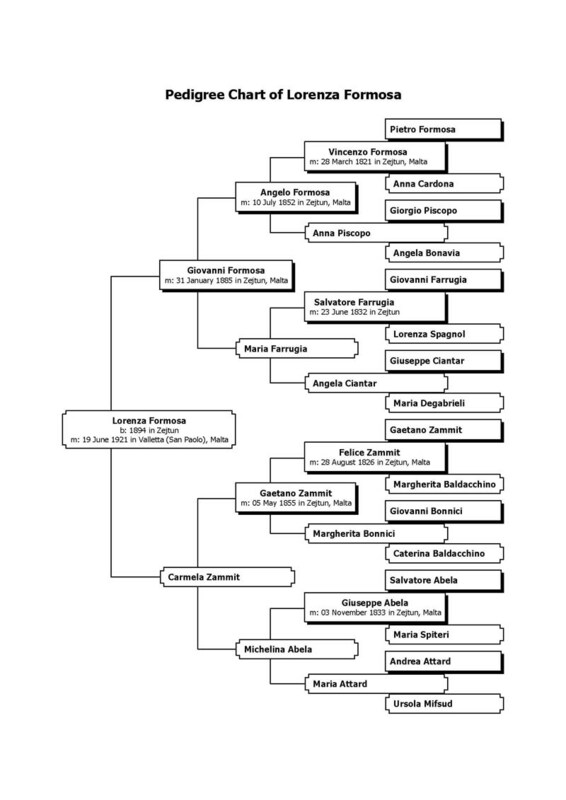 Pedigree Charts - A Pedigree Chart illustrates all the ancestors of one individual going back a pre-determined number of generations. ie: parents, paternal & maternal grandparents, great-grandparents etc… The number of marriages double at each generation. Such research could be commissioned in various stages since it entails fairly extensive research. Biography research – We do have a number of clients who do research into past prominent figures. The main reason being for biography and publication purposes. Other Services – We also carry out research for individuals, both locally as well as overseas, who act as intermediaries. 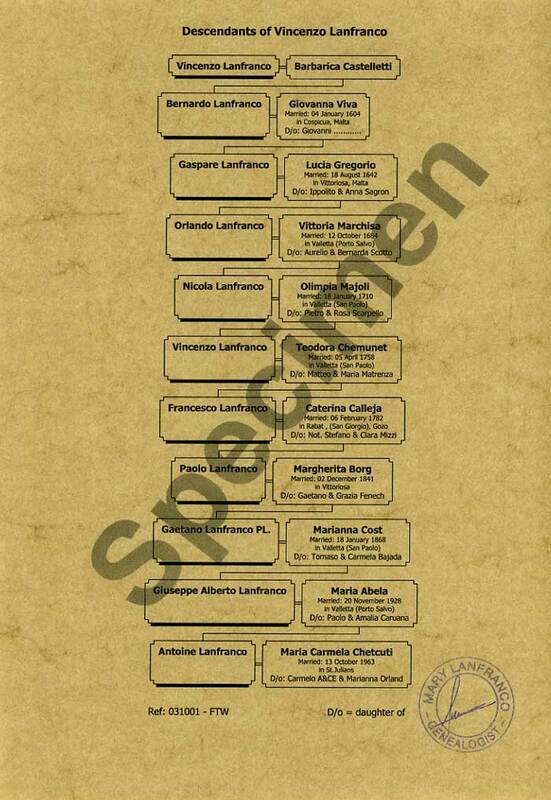 Amongst these are prominent international genealogy research companies who we represent locally.